I forget what polish I used as base, but here is my glitter gradient with my customized Shimmer Polish nail polish, Anouk. I LOVE IT! I was a bit reluctant on the colors at first, but Cindy did a beautiful job creating this polish. Oh, speaking of my friend Anouk, she just recently created a beauty blog, Beauty and Rambles. Please be sure to check out her blog. 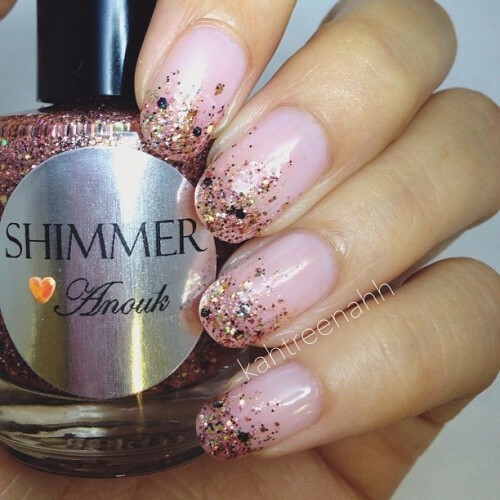 Be sure to check out Shimmer Polish for more beautiful polishes. If you want to customize your own polishes, you can check out this Contact/Purchase page. You have really interesting decorated nail, I love them! I'm starting in the world of the blogs, if you have time look to my blog, pleeeaaaaaaaase! Very pretty gradient, and I love the idea of making a custom polish! This will definitely go on my holiday shopping list.